In the 40’s, the business area at K Avenue wasn’t paved. The road was oyster shells. Sidewalks were board walks. Before it washed away, Atlantic Ave. went all the way south to Everhart‟s property. 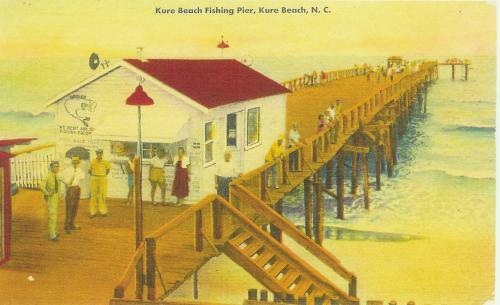 Parking in the center of town was like now – in the middle and on both sides of K. The pier on K had restaurants east of this access road toward the beach. Jim’s was behind the Ocean Inn on pilings. Sam ran the tackle shop behind the ticket office on the pier. Pete ran the snack shop on the middle of the pier. Dow Chemical had a lot of employees living here in the early 30s to the end of World War II. Dow Chemical site, now in the buffer zone, extracted bromide from the ocean front intake. The brick from the torn down factory was used to build many homes in the county. Dow Road was paved all the way to Ft. Fisher gates. Beyond that was sand. The road forked in front of the Riggins. One road went straight; the left fork to the monument got washed away by one of the hurricanes. The Canoutas restaurant was the school bus stop, but Andy bicycled or thumbed to Carolina Beach Elementary. In 1950 students were bused to New Hanover High School. Andy had a key to the restaurant to fix himself breakfast – eggs, bacon grits, and toast. If it was raining or cold, the kids came in to wait for the school bus. They got drinks and nabs. It was pretty dark in the winter when they got the bus. Andy would lock up and ride the bus to school – a long trip on a two lane road.